Space exploration is surely among humankind’s greatest accomplishments. Perhaps the pinnacle of such exploration was when the United States landed men on the moon in 1969. Since time immemorial, humans have dreamed of visiting the moon. When Neil Armstrong and Buzz Aldrin walked on the moon in 1969, they captured the world’s imagination. Armstrong, Aldrin and fellow astronaut Michael Collins received a ticker-tape parade for their accomplishment. It is a feat that remains unequalled to this day, almost 50 years later. However, technology today can bring you the next best thing–a virtual voyage not only to the moon, but to outer space! Come and experience a virtual voyage into space at this year’s Go Galactic! fall festival! At the festival on October 13, we’re super-excited to be hosting a mobile virtual reality lab brought to us by Learning Lab 360. 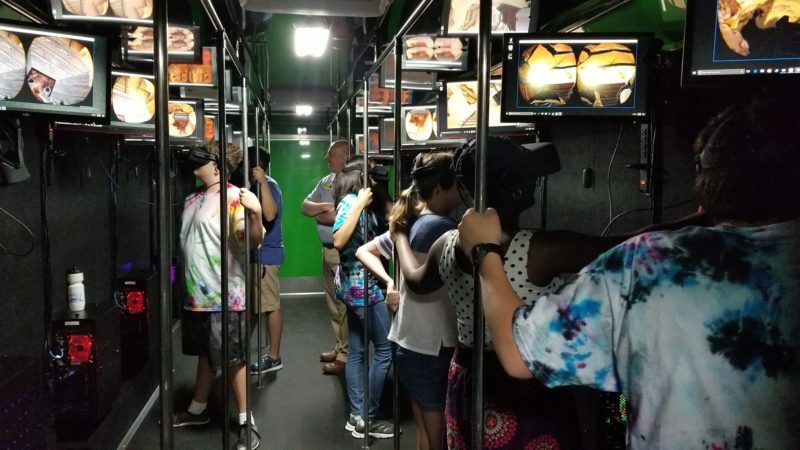 Inside a truck-size trailer, students experience a variety of virtual 3D experiences including walking on the moon, launching with fellow astronauts on the Apollo mission, and more. Using the Oculus Rift VR headset they get a full-immersion experience of space! The launch program is particularly thrilling! It begins with the countdown inside the launch vehicle, as the adrenalin-pumping launch takes you to outer space. Here you see a beautiful view of Earth from space. This is the so-called Overview Effect, which has inspired astronauts since the beginning of the Space Age. It’ll be sure to inspire your little explorer too! The trip continues with roaming the moon surface. The interactive controls allow you to query lunar experiments left on the moon by the astronauts. Relevant information appears on a screen as a heads-up display. As with all festival features and rides, the Learning Lab 360 experience is included with the price of your admission ticket. Click here to purchase tickets. Click here for details about the festival. Join us at this year’s fall festival to experience a virtual voyage to the moon as well as rides, bouncy houses, music, food and local vendors. It’s going to be out of this world!